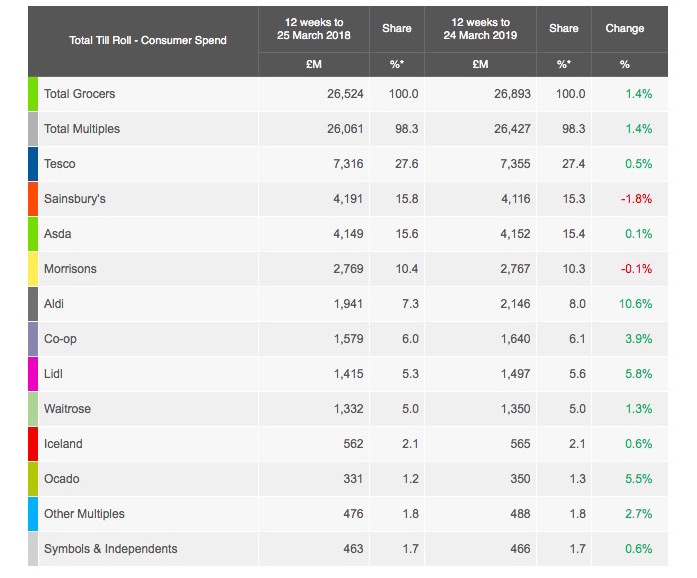 Asda is now the UK’s number-two supermarket, having overtaken Sainsbury’s in the latest Kantar market share figures, for the 12-week period to 24 March. Asda stands on 15.4% market share, following a 0.1% increase in sales, while Sainsbury’s, which saw a 1.8% decrease in sales, stands on 15.3%. “Despite being overtaken by Asda in main-store sales, Sainsbury’s remains the biggest seller of food and drink out of the two retailers, and these figures do not include Argos,” commented Fraser McKevitt, head of retail and consumer insight at Kantar. “Sainsbury’s premium ‘Taste the Difference’ line is still a bright spot, with sales rising 4.4% and the brand growing sales of alcohol, poultry and dairy products in particular,” added McKevitt. Tesco retains the top spot in the rankings, seeing a 0.5% increase in sales, to stand on 27.4% market share. “The popularity of the ‘Exclusively at Tesco’ range continues to rise – its products went home in nearly a quarter of Tesco shopping baskets, and sales reached £138 million [€161.68 million] in the past 12 weeks,” McKevitt said. “The number of sales completed through a deal at the retailer increased to 40.1%, which is notable at a time when the level of promotion across the grocery market has fallen to less than 31% – the lowest in a decade,” he added. Morrisons, which saw a 0.1% decline in sales, rounds off the Big Four, with a market share of 10.3%. The discounters continued to post impressive sales: Aldi saw its sales rise by 10.6%, to now sit on a record high market share of 8.0%, and Lidl’s sales grew by 5.8%, to leave the discounter on 5.6% market share. “Thirteen million households visited Aldi at least once in the past 12 weeks – now more than those shopping at Morrisons,” said McKevitt. “London holds potential for Aldi – as both its fastest-growing region and where its market share is currently lowest – going some way to explain the recently announced trial of the smaller Aldi Local format in the capital,” he added.